Four down - seven to go! On Saturday I remembered that there was a 7.25 mile trail race on in Kirkstall so decided to substitute my planned LSR for that. That increased my planned races to 11 between 23/08 and 29/11 but now its done I'm still over a third of the way through. It was a challenging but enjoyable race, starting with a lap of the grounds of Kirkstall Abbey's ruins, across Burley rugby union's pitches, a drag up the A65, down and along the river until the footbridge at Newlay, then across some fields to the canal which was followed until The Railway pub. That was just over halfway and the turnaround point. From The Railway we headed over the ancient packhorse bridge across the river Aire and then broadly alongside the river before heading up a steep hill to a new housing estate and back to Newlay to head back up the valley to the A65 and a descent that reversed the opening 1.5 miles. This featured paths that I didn't know were there but it was hillier than I'd expected and at one point - after the steepest section - I could feel the bile rising and was reduced to more of a shuffle for 100m or so. That particular hill immediately followed an undulating but long and general uphill track away from the river and I'd decided to take it easy up there. Trouble was a couple of Abbey supporters had positioned themselves there and their cries of encouragement made me feel I had to go onwards hard! The other difficulty I'd had was that my Garmin had frozen just before I went to register. This meant I had to run with no guide as to how far we'd gone or what pace I was maintaining. This wasn't essential as I wasn't chasing a PB but it felt strange. Not sure if it may have helped me though as despite the terrain, the hills, the extra 1.05 miles and the twists and turns I completed it in 53:25 meaning my average pace was exactly the same as for the 10k PB in Sheffield a fortnight earlier! I only ran two other times in the week. Partly because there was little opportunity to run with Bethan but mainly as I was taking it easy on the psoas. I ran with the faster group at Abbey on Tuesday evening. The overall pace was 8:01 - faster than I ran with the slower group as you'd expect - but there were very few stops and those there were lasted only a few seconds, meaning we covered 7.28 miles in a couple of minutes under the hour. I'll stick with them from now. Thursday's run wasn't so great. I did a little over 6 miles but it felt hard work. Opening mile was done in 8:20 and each one hereafter got progressively slower, yet each felt like I was running a minute a mile faster. That's the last two Thursdays that felt tough, but I've a plan to tackle that (more later). My other fitness thing for this week was taking delivery of a bike on Tuesday. I haven't rode a bike in nearly 15 years and even through childhood didn't ride that often so I felt a bit nervy taking it out for a short ride on Tuesday. Yesterday I went out for an hour and a half with a friend and by the end of that felt alot better about hills/gears/bends/traffic. It was a nice ride round Bramhope, Otley Chevin, Guiseley, Carlton, Yeadon and back home. Also pleasing that my running fitness transfers fairly easilly to cycling. Weight was also good news. By Friday I was down to 11st 11lb. I've over eaten and not logged since then but I'll be back on track today and hope to see a further drop this week. Yesterday's run also gave rise to another idea. I'm facing 16 weeks of long runs along the canal again before Paris*, starting in mid December. I like the canal side runs - traffic free, scenic, quiet, flat - but I do want some variety, espescially after my last 2 runs there haven't felt so good. I do have the Abbey run on Tuesday evening but need to do one or two more decent runs a week - especially while Beth isn't running as much )which had added in short, light 'filler' runs). The solution: Kirkstall Harriers run Monday & Wednesday doing runs of 6.5 - 7 miles. I'm going to look into running with them and maybe joining as second claim club. That would give me another run, in company and of a reasonable length, that I could do each week assuming I did one or the other of the Mon/Wed with the Abbey Tuesday run fixed. I'm in Birmingham on Wednesday but hopefully could get back in time to try a run with them this Wednesday. If I do that as well as Tuesday plus the 2 races planned for the weekend that'll take me over 30 miles for the week even without warm ups, cool downs or a run with Beth. Only possible fly in the ointment is a trip to the physio today to check out the psoas where rest might be reccomended. Beth returned to the juniors running club on Monday so I went for a 4 mile recovery run that turned out to be rather more hilly than planned. I took a turn on a whim and ended up going through some hilly woods before running back to the club down and then up steep hills. Ah well, tested the legs a bit after Sunday's race eh? Tuesday was my own day at the running club. I still hadn't got round to joining up with a faster group but the previous week that hadn't been an issue as a small group of us had broken off and ran at a faster pace but this week that didn't happen. I took the first couple of downhill miles easy but from then on was haring off on my own for each interval. A decent enough run but not ideal to have to wait so long between 'intervals' and probably not ideal for the other runners to see someone shoot away. After a rest day on Wednesday I went out along the canal on Thursday evening. It was still and warm as we went through a mini Indian summer and I found it hard work. 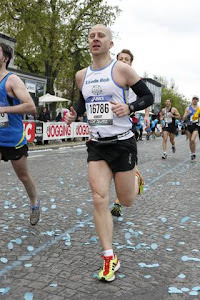 The psoas was very painful for the first few strides and then 'present' thereafter and I felt a bit pooped. I'd planned on doing anything between 5 and 6 miles and ended up doing 5. I decided to pass it off as the bad run before a good race. Rest day again on Friday and then 3 very gentle miles with Beth on Saturday morning. 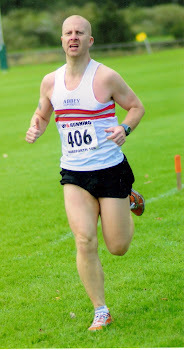 Yesterday was race day - the inaugural Wistow 10 miles. Preparation had been much easier than for the previous week and I was that organised I even took a packed lunch to avoid a McDonalds visit on the way home! Got there early, parked up, listened to the Archers (!) and had a little warm up jog between visits to the loo. Jogged down to the start with some of the other Abbey Runners (there must have been about 15 there)and off we went. It was a flat, figure of eight course mainly on exposed single track lanes. That made it essentially traffic free but occassionally the steady wind proved a problem (I swear it was never behind us). Mercifully the temperature stayed at about 15c and the sun hidden behind clouds. I'd aimed to run at 7:40 to 7:45 miles throughout. That would give me a time betwen 1:16:38 and 1:17:30. Based on the 10k times that looked ok - though it was a decent stamina test - and the fastest 10 mile training run (with a couple of untimed breaks too) only averaged 8:14 a mile. I quickly got into a steady pace aided by the Garmin's new setting of displaying average pace to date and covered the first two miles at 7:36 each. A little faster than planned but not too much. Mile 3 slowed a little to 7:41 and then a few seconds walk to drink water from a plastic cup in mile 4 kept that to 7:42. That was the pattern for the next few miles. I kept my eye on the average pace as it crept from 7:38 to 7:39 and on to 7:41 at one point, again following a few seconds walk to drink once more. By this time the field had thinned out alot. In fact, I don't recall passing anyone after the first drinks station until mile 5 by which time one guy had noisilly and slowly gone past me. By the 6.2 mile drinks station I'd passed two others and went passed the noisy lad again. As I reached 7.5 miles I realised I was very slowly gaining on the gaggle of runners I could see in the distance and shortly after passed one and was within 30m of the next. At the 8 mile mark I passed him and a minute or two later the one after him - though one of the two I'd passed at 5 miles went easilly past me - and was within sight of another. He was passed just as we headed into the last mile. All the way round the mile markers had been measuring 0.05 miles short and I hoped they'd stay that way - giving me a nice little time bonus - but the 9th mile had speeded up to 7:34 again after a couple in the late 40s. I seemed pretty much on track. As we entered the village I passed another runner before drawing alongside another Abbey for a brief word or two of encouragement each way before pushing ahead. I then turned a corner and the finish was suddenly 20m ahaead. I crossed the line at 1:16:52. Not quite down to the first target but easilly within the second. I was pleased - especially as I knew I could have pushed harder in the middle miles and hadn't gone for a fast finish at the end (last mile was 7:28). I did spot that the last mile measured long, something that everyone seemed to be commenting on afterwards, so that not only was the time bonus lost but the final measurement was 10.04. Ah well - more evidence of a moral victory and the average throughout was 7:39! The psoas pain wasn't too bad during or after nd seems ok today. I'll keep working at it and hopefully the absence of a race this week will help. Diet wise, after a couple of weeks where I'd gone up and down but ultimately lost nothing I stuck at things more and was rewarded with being 11st 12.8lb by the end of the week. Yesterday was a post race binge (popcorn, ice cream, malt loaf, roast dinner, Eton mess, M&Ms, digestive biscuits etc) but I'll allow that guilt free. Aim this week is to get some 'space' under the 12st barrier. Wow. Just spotted that last week was the lowest mileage week since the end of April/early May at only 14.49 miles, yet I feel fairly knackered right now! 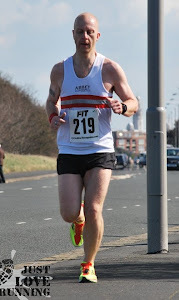 During the 13.2 miles last Sunday I had some groin/lower abs pain that I'd had a hint of during the 2 races the previous week. By Tuesday morning it still felt a little sore and 'Fizz' one of the Paris veterans who is a Physio suggested it could be a sore psoas muscle. I looked it up and it matched the symptoms, location and cause so I've been doing stretches for that through the week. I felt a bit below par during the day on Tuesday and by evening fleetingly considered not going out for the club run. I did though - mainly to test the psoas - which held up ok and I felt much better afterwards. It was a fairly easy paced 5.51 miles but it included the hill on Spen Lane that I'd last ran in March and found tough. On Tuesday it felt pretty easy. On Wednesday I'd normally run with Bethan but we've got out of the running routine since the holiday in France and I'd decided to rest alot during the week anyway so that didn't happen. Similar with Thursday - 5/6 miles planned but I dropped them for the pesky psoas and because I still felt under the weather. I did do a short run on Saturday though. I joined the Virgin Active gym on Friday and did 2 x 1 mile on the treadmill. I found it hard work and couldn't do more than 1/4 of a mile at 10k pace. Between that and still feeling just a little ropey I toyed with the idea of skipping the Great Yorkshire Run 10k on the Sunday. I didn't though, and duly parked up in Sheffield at 8am yesterday. I'd been delighted with 46:33 at Birchwood a fortnight earlier and had decided that with no weight loss in the intervening fortnight I should go for 4:35 a kilometre to nose me under the 46 minute barrier. To that I added the proviso that if I didn't feel I had it in me on the day through muscle soreness or general malaise I could just trot round the remainder. It was essentially an out and back course. The first kilometre was downhill fairly steeply and then there was 500m of undulating followed by 7km that was pretty much flat before 500m undulating again then a final kilometre that was relentlessly uphill. I found it quite tough from the off. After the first downhill I had 26 seconds 'in the bank' as it were and didn't eat much into that as the race progressed but it felt harder work than it did 2 weeks ago - not that I was out of breath or anything just that I didn't feel too peppy and frequently felt negative. The course wasn't exciting and the pace pretty even so little to report until the Garmin bleeped and I began the 9th kilometre, by which time I still had 24 seconds in the bank. I'd been warned the final hill was a bit of a killer but from 1500m to go I found I couldn't speed up and struggled to even hold the pace. I just about held the effort constant on the hills in the second half of that kilometre but i'd dropped half of the banked time. The Garmin bleeped again for one kilometre to go and with me 12 seconds to the good and a strong finisher all should have been well but just getting up the hill felt really draining. I managed to speed up in the last 50m or so but it was hardly a sprint finish. Mentally I'd set my stall just to hang on in the final kilometre and when I looked at my watch as I crossed the line I felt deflated to see 46:04 - missed it by 4 seconds. I'm sure I could have found those seconds somewhere. Then the last 65m at 6:02 per mile pace. The official time rounded me down a little to 46:03 and as thats a PB by 30 seconds I should be pleased - especially as I didn't feel quite in tip top condition and the course had an extra 450ft of climb & descent compared to Birchwood, but having been on course all the way until the finish to breaking 46 minutes and running within the pace target on the Garmin I can't help but feel dissapointed not to have got under that barrier. Spent the Bank Holiday with the family watching the British Grand Prix athletics in Gateshead. We'd never been to an athletics meeting before and all thought it was excellent. £8 each to get in to see a number of recently crowned world champions at close quarters plus a load of freebies, free kids entertainment and events and even reasonable choice of refreshments. It puts football and even the great family game of rugby league to shame. Still from one set of elite athletes to another athlete of rather more modest talent: me. Last week's Tuesday evening run with Abbey Runners was replaced by a team handicap event with a neighbouring running club: Valley Striders. Its an annual event with 17 teams of 5 runners all drawn from a hat. Each team member is assigned to a different 'wave' of runners (A-E) depending on their 10k times and each wave sets off 5 minutes after the preceding one. I was selected in 'D' - the second slowest. It was a toughish course - mostly cross country with a couple of stiles, gates, hills, and runs across fields before running the path round Eccup reservoir. About 5 miles all told. I found it hard work. I'm not sure if my legs were still tired from Sunday but I ran 17 seconds a mile slower (though terrain would account for much of that) but still finished ina position that I was pleased with. I was 4th from the 17 in my wave, went past several runners from the wave before, would have been 7th in the wave above and was caught by nobody from following waves. It was a nice test and a change from routine. The next day Beth and I did a sedate 3 miles along the canal. Friday I decided to do 7.24 miles along the canal and it felt like hard work. Harder than the pace implied. It may be that I wasn't well hydrated and I certainly hadn't slept well the night before or it may be that I was still fatigued. Partly because of that I didn't run with Beth on Saturday. On Sunday I managed 13.18 as an LSR. The overall time was fractionally quicker than I'd have expected but pace was highly variable and, again, hard work. It was also slightly painful in my groin - I'd had that all week after runs. At the moment I'm not sure how to approach this week on the back of that. There's a 10k race on Sunday and then a 10 mile race a week later. I'm guessing I'll cut back the mileage and add more rest. I'll see how I feel after tonight's club run. Weight has been a bit variable (literally) too. After the race at Birchwood I happilly over ate with the result that the following day I appeared not to have lost anything compared to the previous week but by Thursday and Friday I was weighing in at under 12 stone - within sight of my newly set target of 11 stone - but over eating Saturday, Sunday and Monday mean the weight today is ostensibly little different to this time last week. Part of that was down to a meal out (and making a cake) for Sue's birthday so without distractions and with forthcoming races I'm expecting the scales to show me back on target soon.